The Whales and the Dolphins learnt a new painting style. Claudio Baldrich, an artist who expresses himself without feeling limited by mere technique, came to Punta Chica. As soon as he arrived, the children gathered together and started asking him questions, while looking at his paintings on the internet, analyzing the pictures and their meaning. 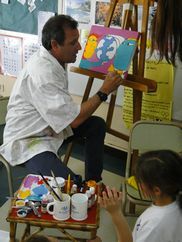 Afterwards, he made a special painting for them inspired by our Environmental Awareness Project. The children remained in a deep silence while the painter created his piece of art. Everybody was delighted to see him finishing the painting. Then, Claudio made two special drawings, one of a dolphin and one of a whale for each class for the children to paint, just as he does. We would specially like to thank Miss Gaby who made all the necessary arrangements for us to have him at school. Thank you Claudio!! It was a pleasure to meet you!